Gertie is sad. The blue lamp leans back and hangs its head. A light object that shows feelings? 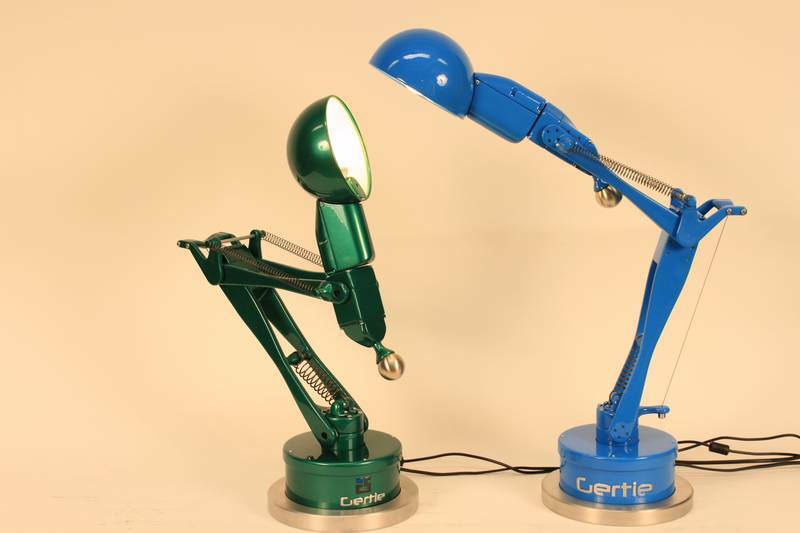 It's possible: Lamp Gertie can express four different emotions by the movement of its body. 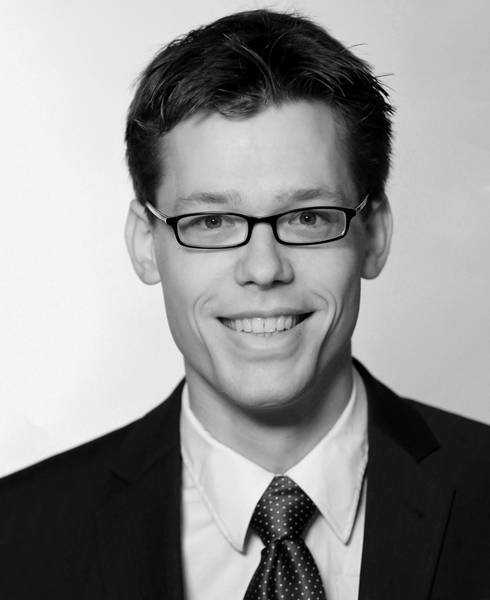 It was developed by TUM student Fabian Gerlinghaus. This fall, he wants to found a company and develop the prototype so that it can be produced in series. 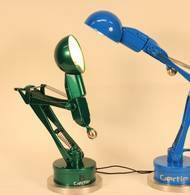 "I was inspired by a little lamp in a short film by the Pixar Animation Studios," Gerlinghaus recalls. "The way it moves makes us think that we can read its emotions. It acts like a living thing. 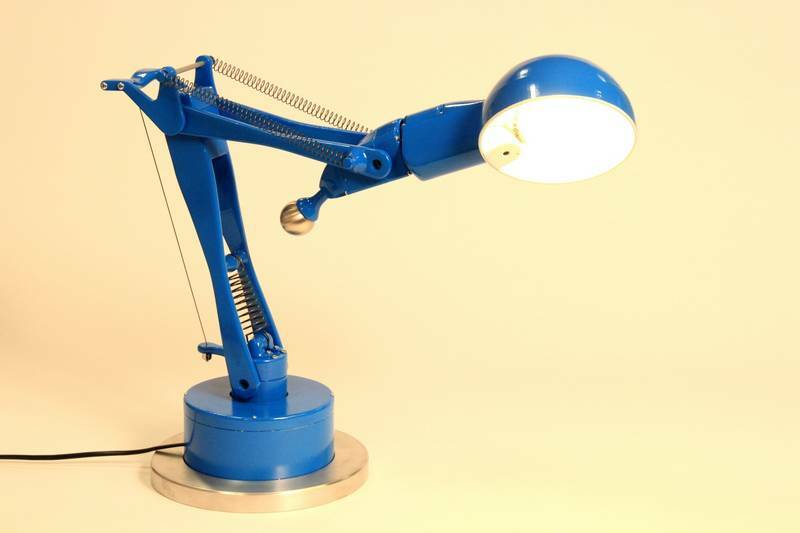 I wanted to build a robotic desk lamp like that." How many axes are needed, how many moves must be possible – and how fast must they be? How many rotations? Gerlinghaus went through a lot of ideas in his head before he was able to design the components by means of a CAD program. The approximately 40 individual parts are made of ABS plastic. Gerlinghaus glued and screwed them together: "I focused on the development of the hardware." He received a lot of support from the TUM's Institute for Cognitive Systems (Electrical Engineering and Information Technology) and the Institute for Product Development (Mechanical Engineering). He was provided with a workplace and with the necessary financial support for the construction of the prototype. 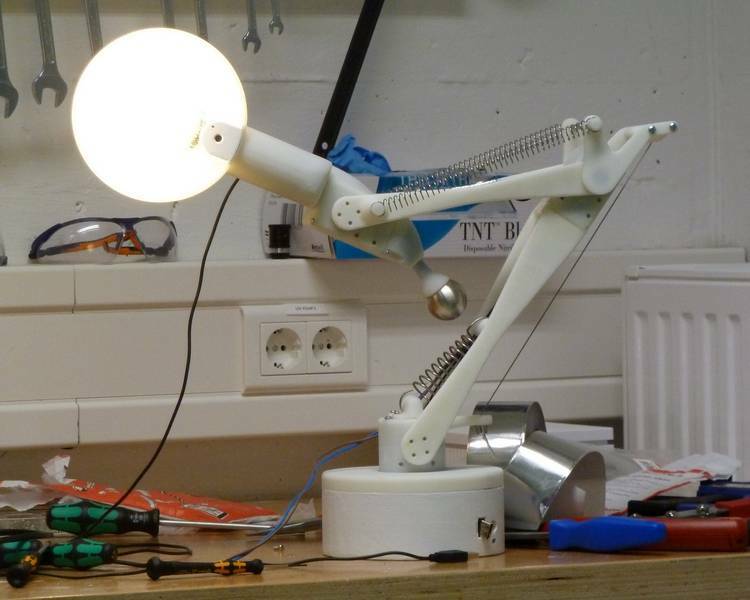 A construction-challenge: The lamp was supposed to hold its position even when the motors are not in use. Therefore, it was necessary to design a precise spring mechanism to balance the weights. 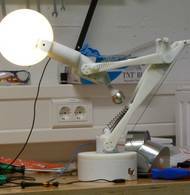 The lamp is moved by five servo motors which are positioned in the joints. All in all, the unit weighs almost 6 kilos. The base is weighted with lead, so that the lamp stands stable and safe even if the large lever performs fast movements. Gertie shows the four emotions happiness, sadness, surprise and fear – and it can also identify a rectangle on a sheet of paper and follow it with its lampshade. But how come we are able to recognize Gertie's "feelings"? "This is a matter of anthropomorphism," says Gerlinghaus, who studied Aerospace Engineering and also completed a course of studies of Technology Management at the CDTM. "We transfer our knowledge about the human body language to objects or animals. The shade of the lamp is identified as the head. If it performs fast movements with an upright head position, humans interpret this as a sign of happiness." Why is the lamp called Gertie? Fabian Gerlinghaus was inspired by the animated movie "Gertie, the Dinosaur" from 1914. It is considered to be the first animated film showing animal figures with a human-like personality. So far, Gertie is available in blue or green. Gerlinghaus is planning his own company to build it in series this winter. It could be used in advertising, possibly as a shop-window display to attract customers – or as a learning model for students in higher education. 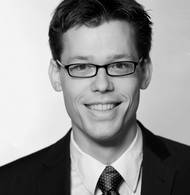 Before, Gerlinghaus has to finish his diploma thesis in the United States – which is also about robotics and control systems. The Artificial Intelligence Lab at Stanford University is developing an autonomous underwater robot . It is supposed to collect samples of plants and rocks from the Red Sea – more accurately than any other robot would be able to do at present. Fabian Gerlinghaus is involved. What to Do When Your Studies Are Not Running Smoothly? "Tell us what we can do better!"